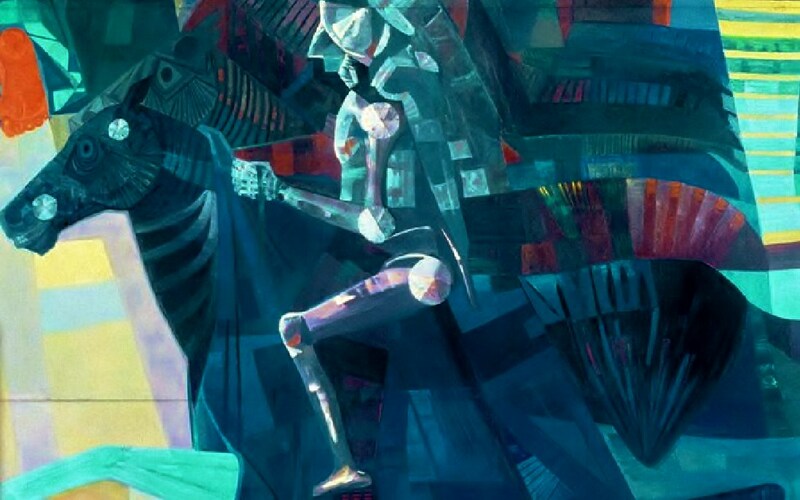 The monumental panels “War and Peace” (Guerra e Paz), Candido Portinari’s masterpiece, will soon be re-inaugurated at the United Nations (UN) headquarters. After an international tour to Brazil and France, where the murals underwent restoration and were shown in major exhibitions, they are back in New York, waiting to be unveiled for the second time in a ceremony that will happen in early September. 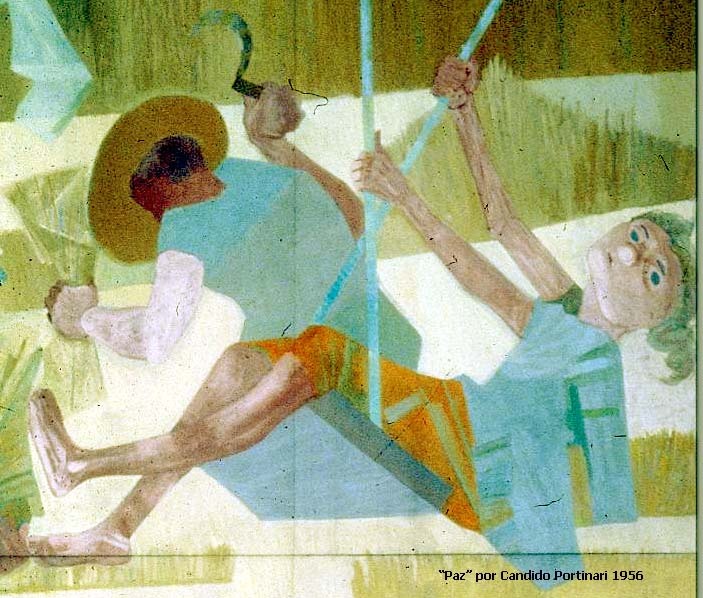 One of the greatest modernist painters in Brazil, Candido Portinari (1903-1962) worked tirelessly on the depiction of the country’s national reality, having left nearly 5,000 pieces that constitute an outstanding account of the Brazilian people, society and traditions during the first half of the twentieth century. 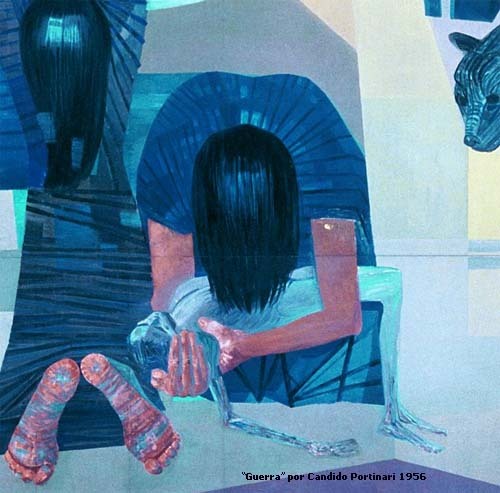 As much as a painter, Portinari was a political activist in favor of social justice who believed in the transformative power of art. Influenced by various European movements – particularly cubism, expressionism and fauvism – as well as the Mexican muralists, he filled his canvases with emotion and criticism, developing a unique style that often combines strong brushstrokes and colors with the distortion of images. Portinari’s vast collection includes some recurrent scenes, such as the plight of northeast migrants escaping drought or relentless peasants harvesting coffee, series that gave him worldwide recognition. But he also portrayed happiness, from carnival celebrations to kids playing ordinary games in the rural landscapes of São Paulo state, where he grew up. 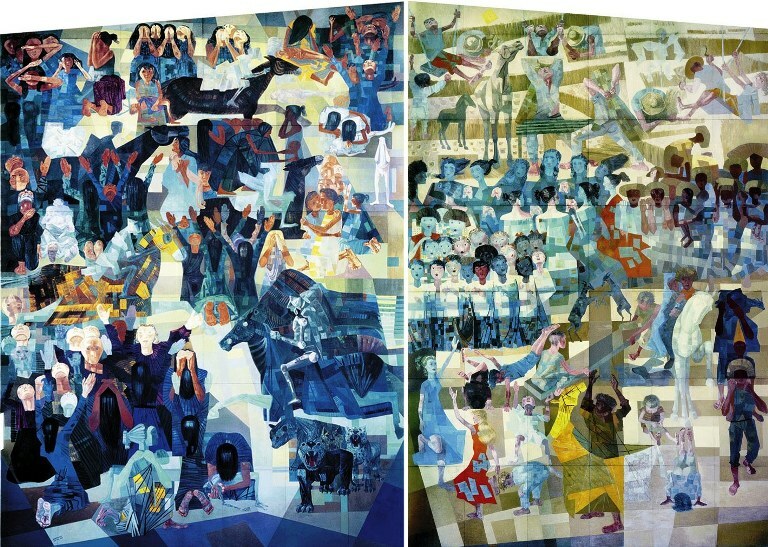 “War and Peace” are Portinari’s gift to humanity and the greatest award for an artist who devoted himself to the pursuit of peace and human dignity. 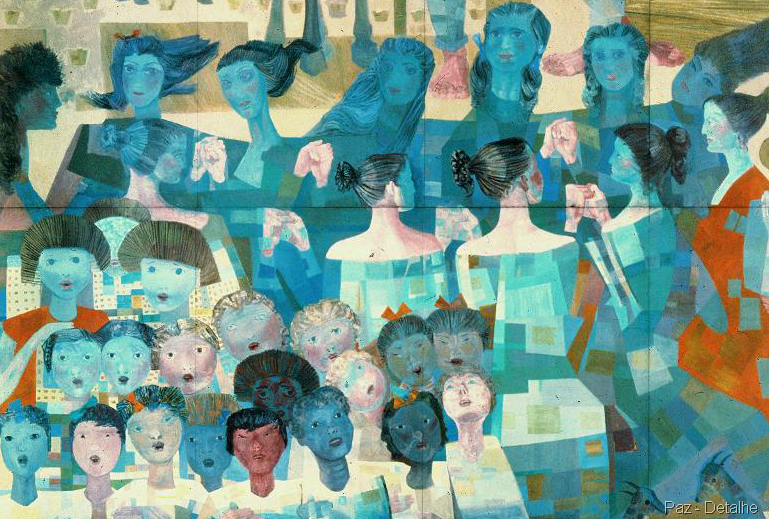 Portinari took on the challenge to make the murals later in his life, in 1953, and they are, indeed, considered a synthesis of his work. In both, he brings back his favorite themes by choosing to represent war and peace through the suffering or joy of ordinary people, the major victims of the modern conflicts. The four horsemen of the Apocalypse are his point of departure for the predominantly dark blue war panel, intertwined with women with faces covered in supplication for the agony to end and Pietà like figures carrying death children on their laps. The sources of inspiration for the golden peace panel, on the other hand, are childhood memories. All figures, except for the plantation workers on the upper side, are boys and girls from his natal village of Brodowski. They play on seesaws, do somersaults, dance and sing in a chorus – scenes intended to transmit to the viewer the sweetness of peace. There could not be a more appropriate place to hang “War and Peace” than the United Nations, the world’s most influential forum, founded in 1945 to prevent the horrors of Second World War (1939-1946) from ever happening again. In the years that followed UN’s creation, the Secretary-General at that time asked the member-states to donate to the organization’s headquarters pieces representing their cultures. The Brazilian Ministry of Foreign Affairs chose Portinari and he was assigned to create something for a highly privileged area: the two gigantic facing walls outside the General Assembly, where policy makers from all countries make decisions that affect people’s lives worldwide. More than half a century has passed since the panels were first inaugurated, in 1957. With the world still ravaged by violence and poverty, “War and Peace” remains as a stark reminder of the contrasts between dark times and brighter ones. They are located, respectively, at the entrance and exit of the General Assembly, functioning as a visual framework for negotiations. While the delegates go into the room influenced by war, they should leave inspired by peace. Watch the opening speech of Secretary General, Ban-Ki-Moon, at the ceremony for the Second Unveiling of War and Peace at the United Nations headquarters, in NYC.